British Somaliland, officially the British Somaliland Protectorate (Somali: Dhulka Maxmiyada Soomaalida ee Biritishka), was a British protectorate in present-day Somaliland. For much of its existence, the territory was bordered by Italian Somalia, French Somali Coast and Ethiopia. From 1940 to 1941, it was occupied by the Italians and was part of Italian East Africa. On 26 June 1960, British Somaliland declared independence as the State of Somaliland. On 1 July 1960, the State of Somaliland united, with the Trust Territory of Somalia (the former Italian Somalia) to form the Somali Republic (Somalia). The government of Somaliland, a self-declared sovereign state that is internationally recognised as an autonomous region of Somalia, regards itself as the successor state to British Somaliland. In 1888, after signing successive treaties with the then ruling Somali Sultans from the Isaaq, Issa, Gadabursi, and Warsangali clans the British established a protectorate in the region referred to as British Somaliland. The British garrisoned the protectorate from Aden and administered it from their British India colony until 1898. British Somaliland was then administered by the Foreign Office until 1905 and afterwards by the Colonial Office. Generally, the British did not have much interest in the resource-barren region. The stated purposes of the establishment of the protectorate were to "secure a supply market, check the traffic in slaves, and to exclude the interference of foreign powers." The British principally viewed the protectorate as a source for supplies of meat for their British Indian outpost in Aden through the maintenance of order in the coastal areas and protection of the caravan routes from the interior. Hence, the region's nickname of "Aden's butcher's shop". Colonial administration during this period did not extend administrative infrastructure beyond the coast, and contrasted with the more interventionist colonial experience of Italian Somalia. Beginning in 1899, the British were forced to expend considerable human and military capital to contain a decades-long resistance movement mounted by the Dervish resistance movement. The movement was led by Sayyid Mohammed Abdullah Hassan, a Somali religious leader referred to colloquially by the British as the "Mad Mullah". Repeated military expeditions were unsuccessfully launched against Hassan and his Dervishes before World War I. 1911 map of Somalia showing British Somaliland and Italian Somaliland. On 9 August 1913, the Somaliland Camel Constabulary suffered a serious defeat at the Battle of Dul Madoba at the hands of the Dervishes. Hassan had already evaded several attempts to capture him. At Dul Madoba, his forces killed or wounded 57 members of the 110-man Constabulary unit, including the British commander, Colonel Richard Corfield. In 1914, the British created the Somaliland Camel Corps to assist in maintaining order in British Somaliland. In 1920, the British launched their fifth and final expedition against Hassan and his followers. Employing the then-new technology of military aircraft, the British finally managed to quell Hassan's twenty-year-long struggle. 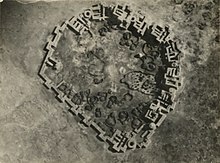 The aerial attack on the Dervish capital, Taleh, killed many members of Hassan's family who had been lured there by the British for an official visit. Hassan and his Dervish supporters fled into the Ogaden, where Hassan died in 1921. The Somaliland Camel Corps, also referred to as the Somali Camel Corps, was a unit of the British Army based in British Somaliland. It lasted from the early 20th century until 1944. The troopers of the Somaliland Camel Corps had a distinctive dress. It was based on the standard British Army khaki drill but included a knitted woollen pullover and drill patches on the shoulders. Shorts were worn with woollen socks on puttees and "chaplis", boots or bare feet. Equipment consisted of leather ammunition bandolier and a leather waist belt. The officers wore pith helmets and khaki drill uniforms. Other ranks wore a "kullah" with "puggree" which ended in a long tail which hung down the back. A "chaplis" is typically a colourful sandal. A "kullah" is a type of cap. A "puggree" is typically a strip of cloth wound around the upper portion of a hat or helmet, particularly a pith helmet, and falling down behind to act as a shade for the back of the neck. Following the defeat of the Dervish resistance, the two fundamental goals of British policy in British Somaliland were the preservation of stability and the economic self-sufficiency of the protectorate. The second goal remained particularly elusive because of local resistance to taxation that might have been used to support the protectorate's administration. By the 1930s, the British presence had extended to other parts of British Somaliland. Growth in commercial trade motivated some livestock herders to subsequently leave the pastoral economy and settle in urban areas. Customs taxes also helped pay for British India's patrol of Somalia's Red Sea Coast. In August 1940, during the East African Campaign in World War II, British Somaliland was invaded by Italy. The few British forces that were present attempted to defend the main road to Berbera, but were dislodged from their positions and retreated after losing the Battle of Tug Argan. During this period, the British rounded up soldiers and governmental officials to evacuate them from the territory through Berbera. In total, 7,000 people, including civilians, were evacuated. The Somalis serving in the Somaliland Camel Corps were given the choice of evacuation or disbandment; the majority chose to remain and were allowed to retain their arms. In March 1941, after a six-month Italian occupation, the British Imperial forces recaptured the protectorate during Operation Appearance. The final remnants of the Italian guerrilla movement discontinued all resistance in British Somaliland by the autumn of 1943. Stamps of the Somaliland Protectorate 1953 issue overprinted in 1957 and 1960 to mark events relating to the Legislative Council. In 1947, the entire budget for the administration of the British Somaliland protectorate was only £213,139. In May 1960, the British Government stated that it would be prepared to grant independence to the then Somaliland protectorate. The Legislative Council of British Somaliland passed a resolution in April 1960 requesting independence. The legislative councils of the territory agreed to this proposal. In April 1960, leaders of the two territories met in Mogadishu and agreed to form a unitary state. An elected president was to be head of state. Full executive powers would be held by a prime minister answerable to an elected National Assembly of 123 members representing the two territories. On 26 June 1960, the British Somaliland protectorate gained independence as the State of Somaliland before uniting five days later with the Trust Territory of Somalia to form the Somali Republic (Somalia) on 1 July 1960. After the state of Somaliland united with the Trust Territory of Somalia to establish the Somali Republic. on July 1, 1960. The legislature appointed the speaker Hagi Bashir Ismail Yousuf as First President of the Somali National Assembly. The same day Aden Abdullah Osman Daar become President of the Somali Republic. In 1991, after a bloody civil war for independence in the northern part of Somali Democratic Republic, the area which formerly encompassed British Somaliland declared independence. In May 1991, the formation of the "Republic of Somaliland" was proclaimed, with the local government regarding it as the successor to the former British Somaliland as well as to the State of Somaliland. However, the Somaliland region's self-declared independence remains unrecognised by any country. ^ "Census of the British empire. 1901". Openlibrary.org. 1906. p. 178. Retrieved 26 December 2013. ^ a b Lacey, Marc (5 June 2006). "The Signs Say Somaliland, but the World Says Somalia". New York Times. Retrieved 2 February 2010. ^ "The Transitional Federal Charter of the Somali Republic" (PDF). University of Pretoria. 1 February 2004. Archived from the original (PDF) on 25 March 2009. Retrieved 2 February 2010. "The Somali Republic shall have the following boundaries. (a) North; Gulf of Aden. (b) North West; Djibouti. (c) West; Ethiopia. (d) South south-west; Kenya. (e) East; Indian Ocean." ^ "Somaliland Marks Independence After 73 Years of British Rule" (fee required). The New York Times. 26 June 1960. p. 6. Retrieved 20 June 2008. ^ "How Britain said farewell to its Empire". BBC News. 23 July 2010. ^ McConnell, Tristan (15 January 2009). "The Invisible Country". Virginia Quarterly Review. Archived from the original on 13 June 2010. Retrieved 27 March 2010. ^ Mohamoud, Abdullah A. (2006). State Collapse and Post-conflict Development in Africa: The Case of Somalia (1960-2001). Purdue University Press. ISBN 9781557534132. ^ Jardine, Douglas James (15 October 2015). Mad Mullah of Somaliland. Naval & Military Press. ISBN 9781781519820. ^ Ross, Sherwood. "How the United States Reversed Its Policy on Bombing Civilians". The Humanist. Retrieved 11 September 2014. ^ a b Ofcansky and LaVerle Berry, Thomas P. "Ethiopia in World War II". A Country Study: Ethiopia. Library of Congress. Retrieved 11 January 2014.